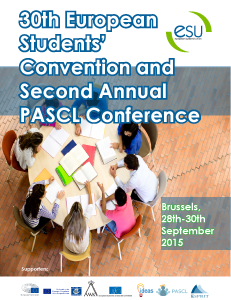 30th European Students’ Convention and second annual PASCL (Peer assessment of student-centred learning) conference. The focus of this edition will be on the role of education and how to make it more inclusive through a student-centred learning approach. The “European Student’s Convention” is a biannual event where student representatives from the national unions of students from 32 different countries meet and discuss the recent and future developments in higher education. A day was dedicated to the “Peer assessment of student-centred learning”. A presentation of the main progress was proposed. After the Yerevan ministerial conference, ESU held the “30th European Student’s Convention” to inform about the latest developments. It was the opportunity to present the revised European Standards and Guidelines for quality assurance, the new ECTS users’ guide, the Implementation report and the BFUG work plan for the next three years.